Neither childhood nor future are growing less…. Supernumerous existence wells up in my heart. The oldest house in the world stands alone, set a little back from the river, where the Great Ouse kinks at the village of Hemingford Grey, twenty-two miles from Cambridge. The cul-de-sac where the village ends is chocolate box pretty: low thatched cottages, whitewashed walls and bottle-glass windowpanes, and the truncated stump of St James’ church spire (the original was blown off by a hurricane in 1741 and never replaced) jutting up over the roofs. Even the telegraph poles are picturesque, festooned with wisteria. You’d be forgiven for lingering here, and never even noticing the house – not so big as a mansion, something more than a cottage – half-obscured by a dense hedge of hawthorn and dogrose. There are no National Trust signposts, nor is there a symbol on your Ordnance Survey map. It’s easy to miss the oldest house in the world. When the masons hewed these stones out of the quarry, England was a wild and untamed land. The house would have been the only stone building – apart from the church – for miles around. The villagers would have been crofters, peasant farmers living in turf and mud dwellings. Then, humans were just one of England’s large mammal species, and shared the thickly wooded landscape with wild boar, red deer, fallow deer and beavers and, a little further north, wolves and brown bear. The total population of England at that point was less than two million, London – an unthinkable distance of 80 miles away – a town of just 18,000 souls. As near as can be established, the house was built in 1120 ad, just fifty-four years after the Battle of Hastings. It was completed when a child named Thomas turned two, the same infant who would grow to become Archbishop and would be murdered by Henry II’s men in Canterbury Cathedral in 1170. This house was already four-hundred-and-fifty when Shakespeare was born. It has seen the rise and fall of every royal house from the Plantagenets to the Windsors – but so have many other buildings. It’s possible that older houses may still exist. There are certainly older structures – churches, castles, abbeys, temples – but what makes this house unique is that for all of its long life, it has been a home. Its walls are steeped in almost nine hundred years of cries and whispers, idle domestic chatter and passionate sweet nothings, the scratch and chirrup of pets and pests; the first cry of a newborn and that same person’s last breath, generation after generation after generation. At its grandest, it was a large-fronted, many-chimneyed Regency manor house. It was here that the beautiful and notorious sisters Maria and Elizabeth Gunning were born in the early 18th century, and from here that they – at their mothers’ insistence – set off for the London stage. At a time when acting was hardly a respectable profession, especially for ladies, they bewitched and scandalized in equal measure, were painted by Sir Joshua Reynolds, written about by Horace Walpole, married nobility and, in the process, put Hemingford Grey (albeit briefly) on the map. All this glamour, intrigue and grandeur could not be sustained, and towards the end of the 18th century there was a great fire which destroyed the grand façade and would have razed a lesser house to the ground. The outer shell was scorched away, but the flames could not breach the three-foot-thick stone walls at its core and the house was saved. Lucy Boston and The Manor at Hemingford Grey were to become inseparable: each inspiring the other in a rich artistic collaboration that was to last half a century. The Manor, which Lucy bought on a whim and quite by chance in 1939 and lived in for the rest of her long life, was the setting for her well-loved children’s books – the ‘Green Knowe’ series – which she wrote between 1954 and 1976. It was her inspiration, the wellspring of her creativity. In Lucy, the house found someone who could strip away the accretion of centuries and restore it to – not its ‘former glory’ or anything so grand or superficial as that, and after all it’s not glory that the house ever evinced, but something closer to the earth, quieter, more mysterious, something organic and spiritual – restore it unto itself, perhaps. And in the house, Lucy found the love of her life, the gateway to the past, a place profoundly connected with deep mysteries: time, mortality, the natural and the supernatural, the self and the other. A few years back, a friend had given me a book called The Children of Green Knowe. She had read the book in her childhood, as she shuttled between England and Australia, and it had lodged in her heart somewhere en route. The look on her face as she handed it to me was both a plea and an injunction. The terms of our friendship demanded that I love it – and, luckily for us, I did. I couldn’t quite believe that I hadn’t heard of Lucy Boston before. The book was a Faber ‘Children’s Classic’ edition, suggesting membership of a club that would include A.A. Milne, Arthur Ransome, Kenneth Grahame and the like. Bells rang extremely faintly when my friend mentioned a BBC serialization in the 1970s, but apart from that – nothing. 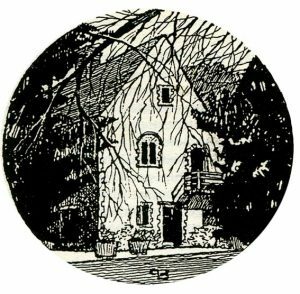 I felt like I’d been let in on a secret: a feeling intensified by the discovery on the last page of the book of a black and white drawing of the house, a telephone number, address, and an invitation to visit. It was like getting to the end of Alice in Wonderland and finding a message from the White Rabbit urging you to send a fax. So I called. Lucy Boston’s daughter-in-law Diana picked up. We chatted for while, fixed a date for my visit, and she gave me instructions how to get there. And so it was that one drizzly July morning, I set off along the A1 towards Huntingdon. The previous owners reassured Lucy that they had explored the house and found all there was to find. She was unconvinced. “Are you psychic?” they asked. “Why, have you a ghost?” she replied, and they all laughed. She consulted architects and antiquarians, historians and builders. She boldly disregarded much of the expert advice – and set to with a pickaxe. She knew the house was old – local records show that the builder, Payne Osmundsen, died in 1154 – but had no idea, really, what lay underneath the walls: what shape would reveal itself, what hidden treasures of light and form, or what sleeping horrors might be shaken loose of their millennial slumbers. It’s almost impossible to walk around the house without succumbing to the impulse to touch the walls. They are warm and cool at once, in the way that only ancient rock and living trees can be, welcoming the hand, seeming not only to be touched but to touch back. In the first book of the Green Knowe series, The Children of Green Knowe, a young boy, Tolly, comes to live with his great-grandmother, Mrs Oldknow; a sprightly and unconventional octogenarian with more than a passing resemblance to the author herself. Tolly arrives in a flood – reminiscent of the Great Flood itself, with the old house something like an ark: a refuge full of creatures, surrounded by water. On his first morning, Mrs Oldknow lets him feed the wild birds, standing on the kitchen step with his fingers caked with margarine and breadcrumbs. The house in the story admits the creatures of the wild as readily as did the real house with its rafters open to the sky. The lively imagination of the lonely boy conjures up the departed spirits of the house’s previous tenants: Linnet, Alexander and Toby – three children who died in the Great Plague of 1665, whose portraits stand over the fireplace in the dining room. When I visited the house, I didn’t see their portrait but up in the bedroom, the toys described in the books were very much in evidence: a sword, a flute, a carved Japanese mouse, china dogs on the dressing table, old ivory dominoes, and a wicker birdcage hanging, empty and open-doored, from the rafters. “They’re not really that old,” Diana explained, patting the rocking horse (though, given where we were, of course, this phrase gives new depth to the term ‘relative’). “Some of them are from Lucy’s own childhood, others have been collected or donated by people over the years.” She points out one of the horse’s ears, chipped where Lucy, as a child, had ridden it so hard it had tipped right over. In this house, Tolly remarks, as he walks in for the first time and is momentarily confused by the mirrors in the hall, “everything is twice”. As you enter for the first time, the line echoes in your head. Indeed it seems so. From the stories, you are already familiar with the inner geography of the house: you know where to find the Music Room on the first floor, the children’s bedroom with its sloping ceiling under the eaves, the French windows in the drawing room that open out into the dappled shade of the ancient beech, half as old as the house itself. From Peter Boston’s eerie lino-cut-like black and white drawings, you have already seen the ebony mouse, the china dogs, the laughing faces of the carved wooden cherubs up near the ceiling in the hallway, one wearing a twiggy wreath where house martins have nested. The real house is such an exact replica as the house in the book that it’s impossible to walk in without a frisson of déjà vu, as though you’re walking in the footsteps of your own ghost. The house is, as Lucy Boston warned, both “haunted and a haunter”. The toys seem to be particularly potent conductors of this mysterious power – perhaps because, by their very nature, they have already been ‘brought to life’ once. In the hands of a child, a simplest of toys quickly passes from inert objecthood to conscious being. But the house is full of other such things which seem equally charged: the ancient iron hook hanging above the fireplace, the lacquered Russian doll on the windowsill, the huge Chinese lampshade that hangs like a moon of skin above your head. The things here are not things in a museum. The house is not dead but living and lived in. The chairs are for sitting on, the umbrella stand at the door there to catch the drips, hooks are for coats, bootbrushes are for Wellington boots, toys are to play with, patchwork quilts are to warm you on a cold winters’ night. Wouldn’t you, dying, want to be at home? Wouldn’t you, dear departed soul, leave fragments of your most intimate, shattered self lodged in the physical stuff of your life – that painted box, those shoes, your favorite armchair? Why wouldn’t Linnet skip lightly across centuries to flip the pages of her favorite book? Why wouldn’t Alexander play his flute? Up in the attic bedroom, there’s movement in the room; as you turn, something is half-glimpsed from just beyond your field of vision. Perhaps it’s just a breeze from the river coming through the open window. I am not sure if I believe in ghosts, but I am sure that if they exist at all, they are not disembodied shades that wander randomly through space and time, but are anchored to particular things. The longer I spent in the house at that point, and the more time it has spent in me subsequently, the more convinced I have become that the material objects that people a life retain traces of that life, becoming semi-animate themselves while conferring a subtle afterlife upon their owners. This is intimately to do with touch and texture: it is deeply connected to the quality of the thing, not just that of the person. I think of things that have had a previous life – biodegradables like wood, cloth, stone – eroding naturally with the passage of time, carrying within themselves some vestige of their previous form. Concrete, plastic, PVC do not age in this way. They may be impervious to more than just the natural elements. Apart from being a writer and a painter, Lucy Boston was an extraordinarily skillful seamstress. During the course of her long life, she hand-stitched twenty-five quilts, cutting the patterns and sewing together the shapes to make patchworks of bewildering complexity. Even in this most domestic activity, there was touch of the shamanic, an awareness that each scrap of material had already lived one life, or more. She uses this trope in The Treasure of Green Knowe (published in the UK as The Chimneys of Green Knowe, 1958), in which Mrs Oldknow encourages Tolly to guess the life history of each patch of cloth as she stitches, and the book itself becomes an interlocking pattern of stories from the past and present. Diana shows me into the first bedroom, off the small landing where the staircase turns. The double-bed is covered in a white sheet which she – having donned white gloves like a surgeon – folds back to reveal the first of Lucy’s quilts: a homely interlocking of scraps of tea-cloth, table linen and aprons, the make-and-make-do result of war time rationing. She peels this back to reveal the next layer, and the next, and the next – each unique, each quite different in tone and color. The bed shrinks with each unveiling. I half-expect to discover a single pea beneath the last. The ‘nip of otherness’ was certainly felt several times during the restoration of the house. On one occasion, Peter fled from a room in which he was working, pursued by an overwhelming sensation of malevolence. Strange noises and poltergeistly happenings became such a regular part of her life, that Lucy once left a local policeman standing baffled outside in the cold: she had been cheerfully ignoring his hammering on the door, assuming that the noise was being made, as usual, by a ghost. During the Second World War, Lucy and her long-time companion, the painter Elisabeth Vellacott, used to hold musical evenings for the squaddies stationed at nearby RAF Wyton. The room is still strewn with the makeshift covers, the mattresses and the bedspreads that Lucy had conjured up to make the men comfortable. She was delighted to discover that the back seat of her car fitted perfectly in one alcove, and there it still sits, casually disguised under a loose bedcover, a single mattress tacked to the wall behind. Today’s guests to the house are treated to a few bars of Mozart’s clarinet concerto, played on the wind-up gramophone whose vast trumpet dominates the room like a crouching beast in one corner. The needle is made from a splinter of bamboo, the trumpet is papier maché painted to look like leather, the disk a heavy slab of shellac. The sound ought to be a mess of scratch, hiss and splutter. But it emerges clear and powerful as though the clarinetist were standing in the room himself, lungs and lips and fingers and reed and body, sending a surge of music into the still air. As we walked around the house, Diana picked up a clear glass bottle to show me. “Peter asked me what I most wanted for my birthday,” she said, showing me the label. “And I said, oh – Time. I never seem to have enough of that.” She smiled and set it back on the shelf next to a weaverbird’s nest, empty and full of afternoon light. She left me in the bedroom where I sat leafing carefully through a picture book, written by Lucy, but which she never talks about in her memoirs, and is rarely mentioned in any bibliography of her works. The House That Grew was published in 1969, and tells the story of two sisters who discover a tiny house in their garden. “It looks like stone but it feels like mushroom,” says one. “I suppose it has just hatched and is still soft.” A ladybug lives there. The next day, they go back to find it has grown to the size of a tea caddy, and a bumblebee has moved in. By the following day, it is the size of a doll’s house, and its latest resident is a green and blue lizard. By the time it has reached the size of a packing crate, two badgers have taken up residence; then some puppies, followed by a deer. Just when you think this is nothing more than a rather sweet tale, an ogre leaps out of the house – which is by now the size of a barn – baring his tombstone teeth, all ready to devour the girls. He comes to a sticky end, defeated by a white witch who wraps him up in spider’s silk. The house, de-ogred, shrinks to a sensible size, and the girls and their family finally move in. It is eerie and homely and so like the house that I’m in that it gives me the shivers. Fifty years before that book, Freud published his seminal essay, The Uncanny. In it he describes the very particular elements that go in to making something ‘unheimlich’ rather than merely frightening or odd. “The uncanny,” he wrote, “is that class of the frightening which leads back to what is known of old and long familiar.” Freud’s fascination for this word was that it contained shades of meaning that overlapped with its opposite. ‘Heimlich’ not only means homely, familiar, domestic, safe but also hidden, secret, occult. ‘An unheimlich house’ is ordinarily translated as ‘a haunted house’. But the Manor is so much more than simply haunted: it is unheimlich to the highest degree. It has all the elements that Freud identifies (and more). There is doubling (“everything is twice!”); there is ‘intellectual uncertainty’ as to whether an object is alive or not (“did the mouse squeak under your pillow, and did the china dogs bark?”); there is unconscious repetition, “the repetition of the same features or character-traits or vicissitudes, of the same crimes, or even the same names through several consecutive generations” (Tolly is the latest in a long line of Toselands; there has always been a gardener called Boggis at Green Knowe). There is even the confusion between the thing itself and the thing it symbolizes – for example up in the children’s bedroom is a doll’s house that is an exact replica of the house itself. The house feels aware: a conscious being made of living stone, with a metabolic rate you can count in aeons. Walking through a house, a real house, that you have not just read about but in a very real sense already inhabited in fiction, produces the most unheimlich effect of all. You feel that you have fallen into the story; that the barrier between what is real and what is imagined is the exact thickness of a page in a book. Things seem familiar – yet not the same, strangely transmuted in their journey from fiction to reality, as though their dimensions have been slightly distorted. In the books, for example, there is a huge stone statue of St Christopher, with the Christ child on his shoulders, stood against one side of the house. The 17th century child Linnet watching St Christopher wading through the black, icy river to take the stone Child to Midnight Mass is one of the most eerie passages in Boston’s books, and the accompanying picture one of the most haunting. Yet here is the statue, standing on the deep recessed window sill. I pick it up and hold it, easily, in the palm of one hand. But to apply Freud’s criteria to this house, to psychoanalyse The Manor if you like, one has to turn the tables and invert the terms. First, you have to bring the building alive. Instead of the eyes being the windows to the soul, what if the windows were the eyes? Instead of the body housing the spirit, what if the house itself was the spirit’s embodiment? If we, for the moment, think of the house as something not solid but permeable, built not on nothing, but over something, the picture becomes even more complex. When Payne Osmundsen chose this site for his building, he occluded a dwelling even more ancient – a Saxon hall perhaps. And those Saxons would have built over a Roman dwelling, and so on. As you walk around the Manor, it seems as though habitations ever more ancient lie beneath your feet. Hidden in the folds of the strange beats the heart of the familiar. The heim (home) exists in as intimate a relation to the unheimlich as the conscious to the subconscious mind. What, then, has this ancient, uncanny building repressed? “Above its obscure silhouette the cloud was outlined with silver on its upper edge, where suddenly a dazzling diamond white segment appeared, and the moon came out. She dropped the cloud from about her, and round and brilliant as a singing note she hung in the centre of the sky. Under her lovely light Green Knowe was revealed again, gentle, heavy and dreaming, with its carefully spaced bushes and trees standing in their known positions enriched with moonlight on their heads and shadows like the folds of Cinderella’s ball dress behind them. By her ninetieth year, Lucy Boston was nearly blind, though still sewing her final quilt with the help of the local children who would stop by on their way home from school to thread her needles. At the age of ninety-six, under pressure from her son and daughter-in-law, she finally consented to have electric heaters installed in the house, but then, on the morning they were to have been delivered, rang Peter to say that she “would rather die of cold in the twelfth century than be warm in the twentieth”, and would he please instruct the men to take the things away. She died, in the home that she loved and which, I have no doubt, her spirit still inhabits, on 25th of May 1990 aged 97½. As I sat in the garden, in a bower woven from living willow, I wondered what lay in store for the house in the future. Diana lives there now, but admitted that its upkeep was getting to be more and more of a strain. I slip off my shoes, and look up at the house through a lattice of yellow-green shoots and leaves. Above the roof, the clouds are streaming up high and, for a moment, the house seems to have come unmoored, set adrift, sailing on the wind towards a far horizon. when the house was nearing its 550th birthday, an epidemic that killed up to 100,000 people, and wiped out a fifth of the population of London. Freud, Das Unheimliche (1919), ‘The Uncanny’, transl. David McLintock, Penguin Classics, 2003.